John Sergeant Wise (1846-1913) was an important contributor to business and civil fields in the period following the American Civil War. His views about American life were often controversial. Wise was born in Rio de Janeiro, Brazil, to a wealthy and powerful American family. After fighting in the Civil War, he embarked on a political career. He became a leader of a reform political group in Richmond, Virginia, and accused the state Conservative party of corruption. He was also later appointed as Federal district attorney, and he successfully ran as a Republican and Coalition candidate. In 1885, Wise ran for governor as the Republican candidate but lost, accusing the Democrats of cheating in the election. The year 1888 was a critical one for Wise, in that he decided to leave politics, and take up the practice of law, not in his native state, but in far away New York City. In this capacity, he assisted in the development of the electrical industry. 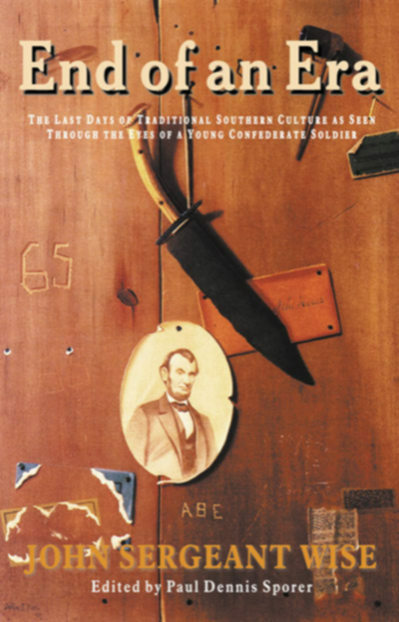 End of an Era, Wise's memoir, is a superbly written narrative about his life during the Civil War, covering many areas in depth, with honesty and candor; his views on the culture and customs of the Old South are consonant with his personality, at once honest, but also sentimental.